20 years ago, we had no idea that virtual reality would be as big as it is today. Thanks to VR, we can now do things we never thought possible like fly a plane, kung-fu fight someone, or take a spaceship around space battling for the rights to the galaxy. VR foosball is a unique way to enjoy this technology, and although playing foosball for real can be fun, this puts a whole new spin on it. Virtual reality foosball is possible and although it might not seem the traditional type of game you’d play in a virtual setting, it certainly has its fans. So, is VR foosball for you? What does it offer that regular foosball can’t? We’re going to delve deeper into this trend to figure out what makes it so good and the areas where it just can’t compete. For a futuristic spin on your favorite pastime, it’s definitely worth checking virtual reality foosball out. When the concept of virtual reality was first announced, we had grand fantasies about using it for things that couldn’t do in normal life. Whether it was robbing a train, fighting spaceships throughout the galaxy, or racing speeding sports cars, all of it sounded like a great chance to escape. As it turns out though, people don’t necessarily always want to do such crazy things with their VR experiences. Some of us want to do the things we can do in regular life, but just in the immersive, virtual setting. Foosball is one such thing, and the tabletop soccer game has been given new life thanks to the opportunities to play it with virtual reality. 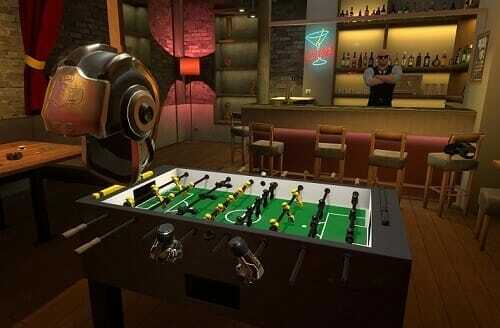 There are a number of VR foosball games now available that allow you to play a game of foosball from your living room without ever even owning a table. Of course, these games require some tech and hardware to work. You’ll need a VR system like the HTC Vive or Oculus Rift, and the right computer or gaming console to enjoy it, so keep all of this in mind. For people already using VR though, it can be a great game to play in this new virtual setting. There are some developers who aim to make VR foosball machines that allow you to play in an arcade setting. 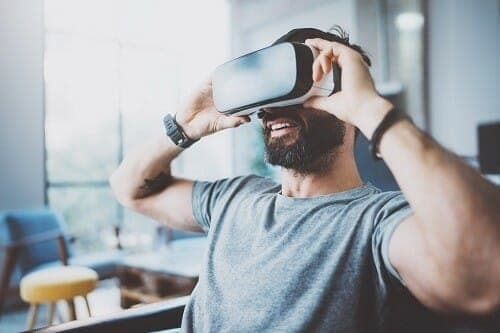 Trying out these devices would be ideal as it means you don’t have to invest any money in buying a complete setup but you still get to experience the wonders of virtual reality. Kolesium Soccer VR is one such model, and they hope to release their machines on cruise ships, arcades, and shopping malls for more people to try. Many of the VR games are still in testing mode, so you’re not going to get the best experience at this point. However, there are some available for download that will give you an idea of what it’s like to play VR foosball with many even offering free downloads. There are options available to play on your own, against a computer, or with other players around the world. Upon wearing your VR goggles, you’ll be standing at a table just like you would in real life and twisting the handles to get your ball into the goal. 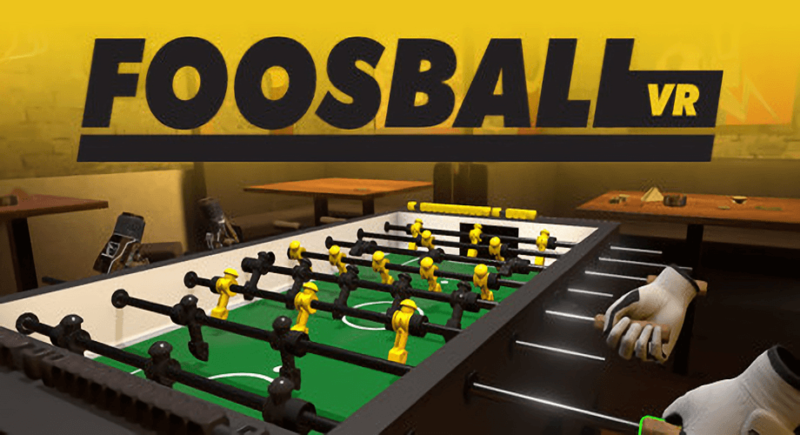 VR foosball games certainly sound like a lot of fun but you need to keep in mind that because the technology is still quite new, they haven’t perfected the experience yet. Some may experience nausea, dizziness or confusion when playing games like VR foosball, so if you’re usually sensitive to things like this it’s something to think about. If you were left with one final decision and had to choose between VR foosball or a foosball table, what would you go with? Here are some of the pros and cons that each of them offer to make your decision easier. In terms of cost, a foosball table can be expensive depending on what model you purchase and the quality you’re looking for. However, paying for a full VR setup and gaming console/computer will usually be thousands of dollars more if you don’t have it already. When playing with others, VR definitely gives you more options for choosing either the computer or random people from around the world so you’ll never be stuck for someone to play with. Although virtual reality can be fun, there’s nothing quite like playing a game of foosball with family and friends. It’s something that all ages can enjoy and gets you away from technology for a while as well. The difficulty of both games would be the same. Foosball takes skill to learn but it’s still fun to play while you’re learning. Both VR and real-life table soccer require patience and time to improve your playing prowess. Foosball is just one small area of virtual reality capabilities. There are so many things that we can now do thanks to this technology, so why not use the chance to do something that’s not possible in everyday life? Sure, playing a game of foosball with someone in virtual reality who lives on the other side of the world can be fun. However, it’s costly and might very well make you sick, and when you have a perfectly good foosball table at home there’s not much point. 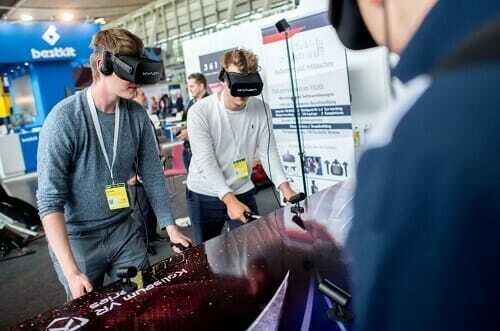 The future of foosball and other VR games looks promising though. Once they develop the technology further and learn how to make experiences more realistic while lessening the dizzying and nauseating effects, there’s no telling how far they’ll be able to go with these amazing devices.